It’s a rare time when I will say that exercising is bad for you. 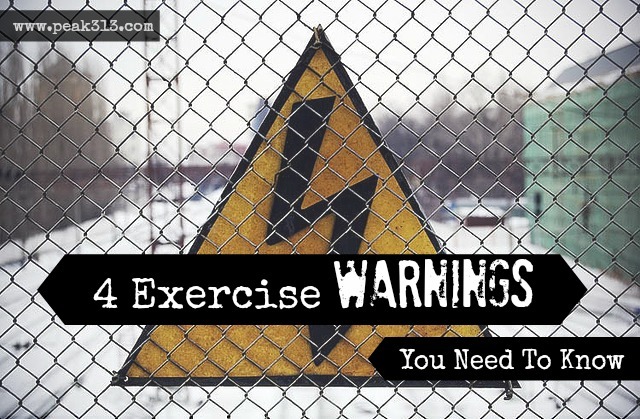 So count yourself lucky that I’m putting “exercise” and “warning” in the same sentence today. I’ve made a few observations lately about what exercising or getting in shape has done to some people. I thought I’d bring them up because I think it’s worth a conversation. These are some ways that I see exercising turning dangerous in our lives. The beauty about exercising is that you can choose to do it alone or do it in a group. You can do it in the morning, the afternoon, or at night. It’s generally readily available for your use. However, this can work in reverse if it’s causing you to avoid situations or people. Listen. I’m the first one to tell you that sometimes the best “mental medicine” for me is to get a little exercise in. There are times when I’m more refreshed and my attitude is better after I just sweat it out for 60 minutes. But what we have to be careful with is that this is a constant answer for when the times get rough. Check yourself: Are you exercising to avoid uncomfortable situations in your life? Are you leaving the house or escaping to the basement so you don’t have to deal with what’s in front of you? Check yourself: If you are married, are you playing with fire? Are you trying to garner the attention of someone at the gym? Single women, conduct yourselves with respect at the gym. Just because a guy doesn’t have a wedding ring on doesn’t mean he’s not married. Pray for wisdom and be on guard! Statistics show that women who exercise (and in particular strength train) have increased feelings of confidence. It’s a huge reason I love exercising! Yes–I love feeling confident!! However, we have to be careful here. We have to keep this all in balance. Check yourself: Are you finding yourself overly confident? Are you “strutting” your stuff a little too much? Are you feeling superior in your attitude towards other people? Parenting. Marriage. Finances. Achievements. Looks. You name it, you can compare it. Iron can sharpen iron, but it runs a close line when the iron outdoes iron. And let’s not forget. Sometimes our worse comparison battle is with ourselves. We are never good enough. Pretty enough. Thin enough. Check yourself: Are you trying to out-do someone at the gym? Maybe a friend who is on a weight loss journey too? 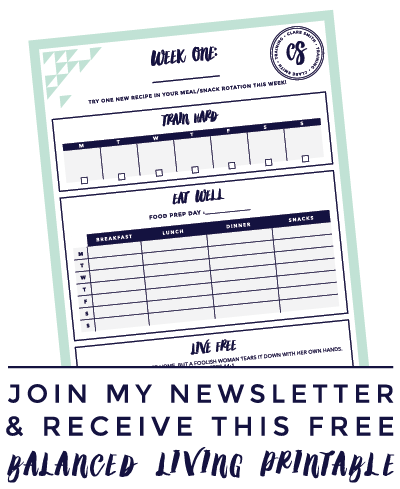 Are you trying to make a weight from years ago that’s causing you to have unhealthy habits? Exercising is my thing. It’s my bread and butter. I truly believe God has gifted me with this passion and talent for His glory. But let me tell you. It’s not the ONLY thing. Our physical health is part of a much larger equation. Let me suggest to you that one way to keep the above dangers in check is to always make sure that your spiritual health is in better shape than your physical. My last piece of advice is this. Anything that we do in life, be it our housekeeping, hobbies, parenting, exercising or shopping should always bring you closer to your husband and family and keep you roadblock free in your walk with God. If you find that anything is muddying the waters in your life, it’s time to take a step back and evaluate—no matter how healthy or good it is. Remember our final goal. Our bodies will be gone but our spirits will live forever. I have heard way to many stories of people doing BeachBody or P90X, transforming their shape, and then suddenly are having an affair. Too many to count. The confidence one definitely struck me – something to keep in mind during my conversations and even on my blog. Excellent truths Clare! You are right on target with all of these points. All very good things to keep in mind when trying to get healthy AND please the Lord. Isn’t it so true how Satan is a prowling lion watching and waiting to destroy us. We begin doing good things, but even then, he tries to lure us in subtle ways to destroy us. Thanks for the warnings!! This needed to be said! Thank you – I’m going to post it on my facebook page right now :)! I appreciate your willingness to share how exercise can have some down sides if we have wrong motives. And it is so true that just because someone doesn’t wear a wedding ring doesn’t mean they aren’t married. An old co-worker of mine didn’t wear a ring because he lost a lot of weight after he got married and his original ring no longer fit. A service provider at my old job didn’t wear a ring (and was a huge flirt) and I about fell over when he finally mentioned something about his wife. I had talked to him on a weekly basis for 2 years and had no clue he was married. I imagine he didn’t wear a ring due to the good chance of it getting ruined due to the kind of work he was in. I rarely wore my wedding ring when my daughter was little for fear of scratching her with it (I don’t know if this is a common concern, but my daughter did get scratched by it a few times and even my husband has been scratched by it.) I did try to wear it when I was out in public, but sometimes I’d forget. I have to say that I started running in July started it as a Bible Study group called “Run For God.” The amazing lessons learned through the whole trials of running. As I was running I had to draw on the strength of my Lord to get me through…I felt that I was failing He kept me strong. I was able to accomplish the goal with the encouragement of friends and family….I ran my first 5K and after mile 1 my knee went out…I ran for 2 more miles on it…not because I’m a superhero…but because I sat out to achieve a goal and my God got me through…I finished….I was determined….I did it! Since that day for the past month I have had to be “still and listen” I have had to let my knee heal…I have learned to endure…to rely on my Lord once again…and I have been encouraged by my friends that this is just a “season” soon I will be running again. When I run it releases stress, I love to pray and run in the beauty of creation…I feel closer to God when I do this. I love to run with my friends…a goal we can accomplish together. My family is now running, its a common goal we all share. Learning to take care of our temple and still sharing our faith in Jesus is a win win. I’m tired of christians who don’t exercise, don’t care what they put in their bodies and say “Lord bless this food and help my body…” and then are amazed at when their bodies fail…what kind of example is this? I agree that some of us can go over the top with keeping our bodies fit…but Jesus didn’t ask us to be fat and tired….if we are we aren’t able to be a witness for him…you have to have energy to serve….not just reaching for another bowl of ice cream with the attitude of ” oh well….this isn’t our perfect body I can do what I want.” and feeling good about myself doesn’t mean that I’m going to have an affair….I’m not saying that I’m above that….I’m saying that we as women…when we feel better and look better we are able to care for our families and our husbands in a way that they need and deserve. That’s all I’m sayin…so I’m going to keep running….yep! I know the red flags have gone up when talking with a friend of mine who has a personal trainer that is a young (20 something) man. She is a married woman in her 40’s, with two kids, yet she is going to the gym 3 times a week, working with this man. She would mention him in conversations, and she seemed to know alot about him. For me – this is just a potential hazard waiting to happen. With all the different exercise venues these days, surely married women can find female trainers, videos, buy their own equipment or simply walk or run, to stay in shape, and avoid putting themselves in positions where the enemy can have a hay day! Great post! So true! Thanks for sharing. I can honestly say, with MUCH thankfulness to God, that my husband and I are sooo much closer–both mentally, emotionally and physically, since I have started my fitness journey. I thank God for it daily!!!!! With 3 small children—it is wonderful to be more deeply in love every day!!!!! I love the heart behind this post! Exercise has been a blessing for my entire family, but a continual heart check is ALWAYS wise!! Thank you for such great reminders and saying the hard things!